Nutella Puff Pastry Danish - Let the Baking Begin! Nutella Puff Pastry Danish is a delicious Nutella dessert you will love! This Danish recipe has a crunchy yet smooth chocolate taste in every bite. A simple and great puff pastry recipe. PIN this Danish Recipe to your Pinterest board! Well hello there! It’s been a while, hasn’t it? Are you enjoying the warm weather yet? Today is such a sunny day in Portland it’s hard to stay indoors. But I managed to bake these incredibly easy but so, so delicious Nutella Puff Pastry Danishes. Yep, I fell for it again and got myself a big pack of puff pastry again. 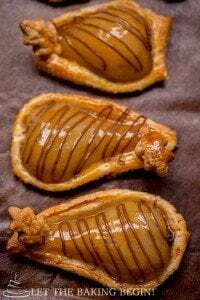 It’s just so convenient and easy to throw Puff Pastry Desserts together, using the premade dough. Take these Nutella Danishes. If you wanted to, you could make them with just 2 ingredients, puff pastry, and Nutella. I wish you could hear the crunch when you bite into these, especially when they’re freshy-fresh! This Nutella Dessert is pretty spectacular, especially given the amount of effort that’s required! Give this Puff Pastry Recipe a try next time when you need a quick treat, but don’t blame me if you get addicted! You’ve been warned! 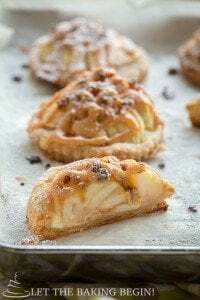 How do I get my Puff Pastry Desserts to be crunchy? To create a crunchy outside, brush the outside of the pastries with egg and sprinkle with sugar. Preheat oven to 400F. Line a baking sheet with parchment paper, set aside. If you want to make really puffy Danishes, put 2 puff pastry sheets on top of each other and go over them with a rolling pin before continuing (I am using commercial puff pastry, so it puffs up more than regular Pepperidge Farm brand). Brush the slightly thawed dough with the whisked egg. Sprinkle with half the sugar and cut into 9 squares (3 x 3 squares). To make smaller pastries, cut the dough into 16 squares (4 x 4 squares). 3. Spoon about 1 tbsp of Nutella in the middle of each square. If making them smaller spoon only 1/2 tablespoon on each. Pinch two opposite ends of each square firmly and flatten the pinched ends. Brush with the remaining egg and sprinkle the tops with the remaining sugar. Bake at 400F for 12-15 minutes, rotating the baking sheet halfway through until pastries are deep golden in color. 4. 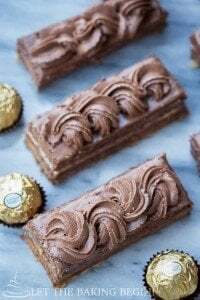 *Optional* – Add 1 tablespoon of nutella to a sandwich ziploc bag, heat it for 10 seconds, snip the corner of the bag and drizzle each pastry with more Nutella on top. Otherwise, allow to cool to room temperature and serve. Be very careful as Nutella inside will be very hot if you try to eat it while it’s still warm. What is your favorite Puff Pastry Recipe? I love making puff pastry recipes, especially when I buy the large box of frozen puff pastry. 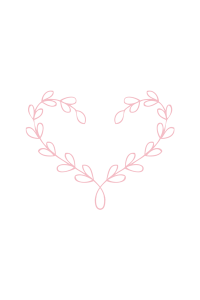 There are so many different things you can do with them. What are your favorite things to make with frozen puff pastry? 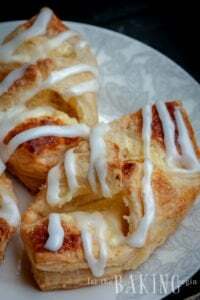 Almond Cream Puff Pastry Braid – Pastry braid filled with a very versatile cream. Puff Pastry Berries & Cream Tarts – Simple and great mini dessert tarts filled with tasty flavors. 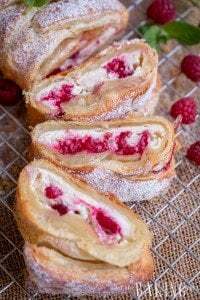 Raspberry Cheesecake Danish – Great solution when you have a sweet craving! Spoon about 1 tbsp of Nutella in the middle of each square. If making them smaller spoon only 1/2 tablespoon on each. Pinch two opposite ends of each square firmly and flatten the pinched ends. Brush with the remaining egg and sprinkle the tops with the remaining sugar. Bake for 12-15 minutes, rotating the baking sheet halfway through, until pastries are deep golden in color. If you want to, you can add 1 tablespoon of Nutella to a sandwich ziplock bag, heat it for 10 seconds, snip the corner of the bag and drizzle each pastry with more Nutella on top. Otherwise, allow to cool to room temperature and serve. Be very careful as Nutella inside will be very hot if you try to eat it while it’s still warm. Hi!!! I’m def gonna try these for a brunch I’m hosting. Do you think these would work well with jams and jellies? Will the heat cause it to become runny? If I make them the night before, do I need to thaw them out the next day before baking? I think if I were to use jams and jellies, I would make sure to pinch all four corners and make it into a square. This was the jam would stay inside instead of oozing out as it bakes, because the heat will most definitely make it runny and you will be left with just puff pastry and no jam inside. If you make it the night before, just freeze it and bake it next morning straight from the freezer. Do not thaw. If I let pastry filled with Nutella sit oversight, will the Nutella soak through the pastry making it soggy? The Nutella will not soak through per se, but the moisture in the air will make the pastries loose its freshness and become less crispy. If you want to, you can freeze the pre-filled, pre-shaped pastries and then bake them right before you need them, or you can bake them and then just re-fresh them by popping in the oven for about 2-3 minutes at 350F to give them that fresh crispiness.